Welcome to the October Gifted Gorgeousness link-up. The link-up date will continue to be the 15th and I will keep the link-up open until the end of each month so you have plenty of time if you are late posting. In the past month I have stitched quite a few gifted pieces and had one epic long-awaited finish! This is the one you've all been asking about and waiting for; the Donna Kooler Tinies! I've been hiding these in plain sight of the recipient who never guessed they were for her. 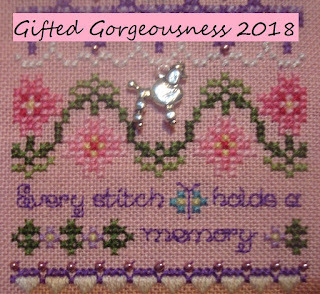 Rewind time to a few months ago and the lovely Leonore announced that she was getting married in October and if anyone felt inclined to stitch a decoration she would be very grateful. What a lovely idea I thought. But only one decoration? Oh no, we can do better than that. Those of you who know me well, know how obsessed with a series I am. If the design says "1 of a series of 4/6/12/196" then I am in and stitching it. Witness my collection of 12 Days of Christmas designs! One tradition I love is the German tradition of The Bride's Tree. When a German couple get married, their first Christmas Tree should have a series of 12 ornaments each representing a different wish for the happy couple. This was the obvious thing to stitch the Germanic Leonore and her handsome husband. I bought the little balsa wood frames from Wilkinsons in a set of 12 (perfect) and simply glued each piece of the 22 count hardanger to the back of the frame, then stuck a piece of white card to the back of the fabric and finally glued a piece of green felt to the frame to finish the backs nicely. I remembered to sandwich the ribbon between the felt and the paper to make a hanging loop for each one! Now it is your turn to show us your Gifted Gorgeousness for the month. Please use your name or your blog name in the field and NOT the words "October Update" so I can easily see who has linked up this month. And link to the actual post, not just your blog. It is easier if you copy and paste the link, rather than typing freehand. Jo your 12 wedding gifts are gorgeous, what a lovely thing to do. Jo I absolutely love the gift you gave Leonore and her husband! How loving. Jo. Those tinies are absolutely stunning and you did a fantastic job of finishing them. The frames are perfect. Nice progress on all of your Halloween pieces. I'm loving all the Fall-ish patterns you've used this month. The fabric for Raven is gorgeous!! I love your idea for the Bride's Tree!! What a lovely gift for your friend who is getting married. I adore the little frames. I wish we had something like that here in the US!! Thanks for hosting the blog hop, I would love to participate! I wondered what you would do with the small designs. They look so wonderful on those frames! What a wonderful idea. Love all the Halloween designs! Such a lovely post. Raven is stunning, and I particularly love your 12 Bride ornaments. Very creative framing as well. Awe, your Smiling Jack O'Lantern is adorable! I love that you made those wonderful ornaments for Leonore and her husband for their wedding, what a treasure to keep forever. I'll have to ask my Mother if she has anything like that. Fabulous ornaments! Well done. "Brew Ha Ha" is too cute. Love that beautiful fabric you are stitching "Raven" on. Looking forward to the Hallowe'en blog hop! Eeek! What a gorgeous idea to stitch all those tiny pictures for Leonore! Such a special gift, you are such a sweet person! 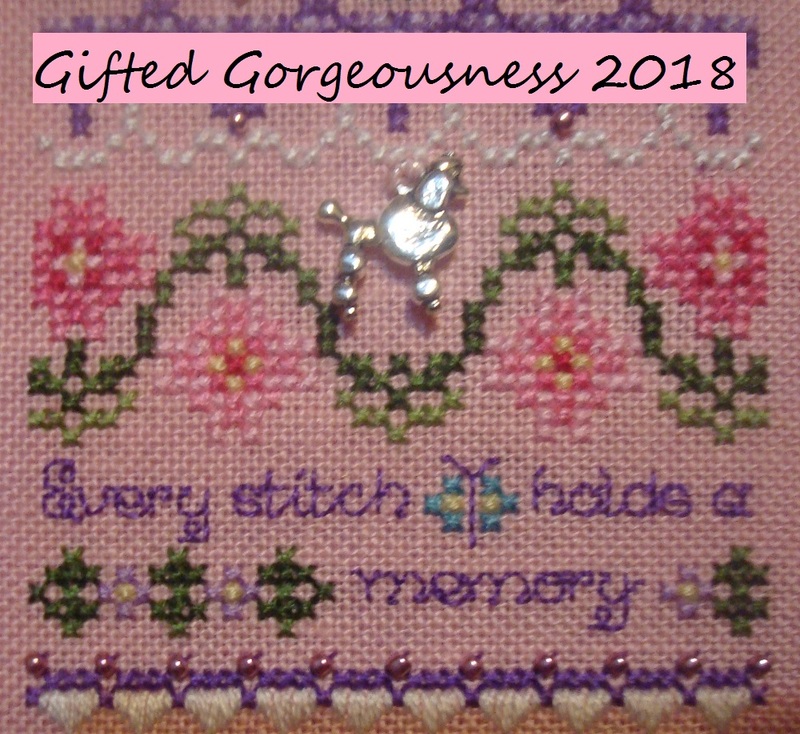 Wonderful stitching done for Leonore, a really nice thought and the little frames are perfect. Jo: The ornaments are wonderful, what a great idea for finishing, the frames are adorable. Brew Ha Ha is so sweet, you are one busy stitcher. Oh you're such a stunner. Leonore and hubby will be so grateful for your beautiful stitching of Bride's tree. I still audibly *gasp* everytime I see Raven and that fabric. Wowsers love it! Could you please include me in the Halloween blog hop too stunning Jo? Your gift to Leonore was just lovely! I will take part in your hop. Do I have anything spooky? Hmmm. Will have to dig something up out of the stash! Such a very special and personalised gift for Leonore, what a treasure you are. Bride's tree ornaments are amazing!AriadnefromGreece! Brilliant gift for Leonore. I missed that post as I've missed many this year. Beautiful idea on finishing too. I struggle with 22ct hardanger for xstitch sometimes, did you stitch 1 over 1 or 2 over 1? I finally got my post up and am all checked in. Love all your beautiful stitching of course. I just LOVE the gift you made for Leonore! How perfect!! The finishing is fantastic. Great Halloween stitching, and I can't thank you enough for those cute ornaments! And now you can finally share the secret ^_^ Well done hiding in plain sight! Terrific Halloween stitching. I love your wedding gift for Leonore. It is so thoughtful. Whew, made it in time; I've been on vacation with veeeery limited Internet access! For Leonore! The bride's tree is such a neat idea. And good job sneaking them all into various Smalls ahaha~ The teapot looks delicious. And I never knew a pine cone stands for eternity; how sweet! The little cat is cute in Smiling Jack O'Lantern. Actually, that whole chart looks adorable! What an amazing collection of ornies and perfect gift! The frames with ribbon add a lovely finishing touch.